Spinach and Mozzarella Egg bake is one of the easy and tasty side dish that can be prepare at home with less ingredients. This can be served with hot rice, roti or chapati. Spinach and Mozzarella egg bake is one of the best choice for those who are on low carb diet. 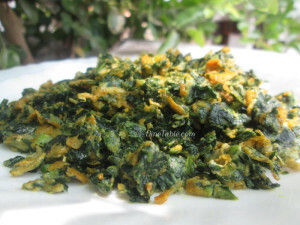 Spinach and egg is highly packed with lots of nutrients.Spinach helps to fight against cancer, diabetes, heart diseases, regulates blood pressure, protects from age related memory loss, good for the eyes, bones and more. Try this simple & healthy recipe at home! Take a pan then add 1 tsp of oil and chopped spinach. Saute for 3 minutes. Add beaten eggs to pan with spinach and scramble. Cook together for 5 minutes. Add salt, pepper, mozzarella cheese and mix well. Tasty Spinach and Mozzarella cheese Egg bake is ready.